Alrighty, this is Tucker... 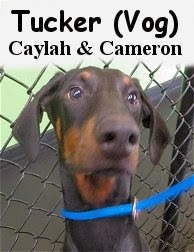 He is a good looking, six month old, forty-eight pound, black and tan colored, Doberman Pinscher. Tucker had his assessment the other day, and he did a fantastic job hanging with our pack. This young pup has already socialized with quite a few dogs, and has had several visits to the dog park. Although new to the "Daycare Scene", Tucker appears to be warming up to it nicely. He's been meeting and greeting others in the Big Roll pack, but hasn't done tons of playing just yet. He was in today, and lucky for all, really began to get in the mix. Tucker ended up having a wonderful play session with Fort regular, Gage, during "naptime". It was rather enjoyable to watch Tucker get into his comfort zone and "bust out" a little. He did a lot more today compared to his first visit... And that's ok, first days can be a bit overwhelming. Tucker is becoming a great addition to Fort Fido. He's always welcome, and we may be seeing him regularly. Those "un-cropped Dobie ears" are so darn cute too lol.